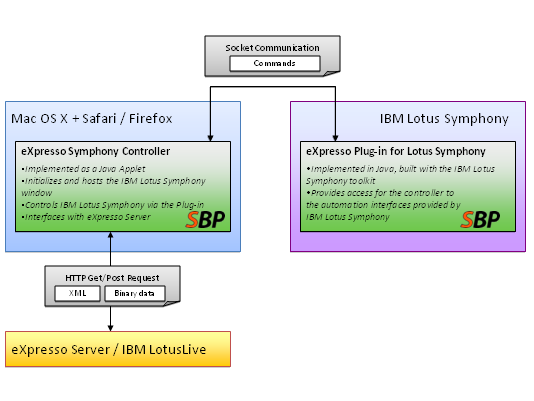 SBP provided implementation and support for the IBM Lotus® Symphony™ integration into the eXpresso extensions for IBM LotusLive™ on several different operating systems and browsers. 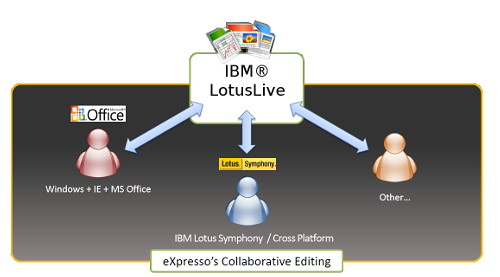 The main goal of the project, which was initiated by eXpresso Corp., was bringing real time collaboration features to IBM LotusLive™, in a cross-platform / cross-browser solution. IBM Corp. is the world's fourth largest technology company and the second most valuable global brand. IBM is one of the few information technology companies with a continuous history dating back to the 19th century. IBM manufactures and sells computer hardware and software (with a focus on the latter), and offers infrastructure services, hosting services, and consulting services in areas ranging from mainframe computers to nanotechnology. eXpresso Corp. is an award-winning SaaS provider of real-time document collaboration for Microsoft® Office. Its patent pending Asymmetric Collaboration service enables business users to share and collaborate on business documents from any location. Document owners may control an individual’s editing responsibilities by personalizing the visibility and rights for specific file elements. Since its launch in 2007, eXpresso Corp. has added customers from a variety of industries: Manufacturing, Shipping, Dealerships, Retail, Banking, Education, Real Estate, Churches, Non-Profit, Consulting, Travel, Household Services, Insurance, Security, and more. The privately-owned company is headquartered in Palo Alto, California. Software Business Partners is a software outsourcing company based in Bucharest, Romania. It provides programming & consultancy services for a wide array of technologies. Well established yet constantly seeking to improve its professional practices, SBP brings technical expertise and strategic vision to its worldwide partnerships. Operating in a dynamic outsourcing market, that rapidly expands on a global level, SBP has responded to the increasing interest (displayed by North American and European companies) for offshoring to highly trained staff located in Eastern Europe, and Romania in particular. SBP's long term strategy and goals rely on promoting the Romanian IT&C excellence on the competitive international outsourcing market. The main purpose of the project is to bring the real time collaboration features of the eXpresso engine to the IBM LotusLive™ environment. 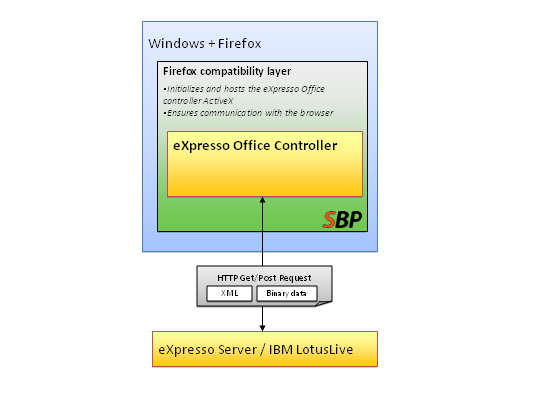 Using the eXpresso engine, users can work in parallel on documents, and are able to view the changes in real time. This greatly simplifies collaboration and avoids the confusion caused by multiple document versions.